If your air conditioner is not working as well as you’d like, you have two main options. You can either repair the air conditioner, or you can replace it. However, determining which option is the right one for your system can be a difficult decision. Today, we’ll take a look at some of the main points you should consider when debating between repairing your HVAC system, or replacing it. HVAC systems are not indestructible, and older systems may cost more to repair simply because the problems are more severe. Most air conditioners have an average lifespan of 10 years. Depending on the age of your system, it may make more financial sense to simply replace your HVAC. Technology has improved and new HVAC systems are designed to be more energy-efficient than older models. If using your older HVAC results in increased utility bills, it may be time to replace the unit. After the initial investment in a new system, you’ll likely see significant savings on your heating and cooling bills. 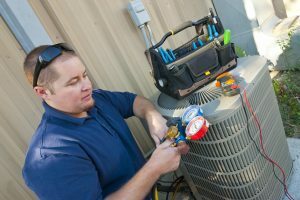 If you’re calling a licensed HVAC repair technician multiple times per year to get your unit fixed, you might be better off replacing the system. While we enjoy helping you, there’s no reason you should have to call us for more than routine maintenance and the occasional HVAC repair. If your system breaks down frequently, replace it. Contact the experts at Hughes Mechanical in Denver. Our technicians are licensed and NATE certified, guaranteeing you a proper installation every time. We stand behind our services and guarantee our work for two years on most repairs and installations.